Beyond essential gardening equipment, there are other gardening tools that you can add to your tool supply as you feel the need or simply prefer to have and use. Among the possibilities are a garden hoe, a pair of pruners, a hand cultivator, a steel and/or flexible rake, and a garden fork to name a few. If you continue to add tools to your gardening supplies, you may want to invest in garden tool holders of some sort also. Possibly garden tool racks if you have a shed or garage to mount them in to keep your gardening tools organized, dry and protected from the weather. Garden hoes can be used for chopping clumps of soil or for weeding while standing. Remember to purchase well made tools and check for comfort when standing or bending using your hoe. Be sure the handle is the correct length for your use. The simplest hoe has a straight edge with a square blade at a right angle to the handle. The hoe pictured here also has a fork on the opposite side of the straight edge. A swan hoe has a cuved neck and a diamond hoe has a diamond-shaped head that is great for weeding between plants. If you prefer to weed by hand and use your shovel to chop up clumps of soil, you may find that you'd prefer to do without a hoe altogether. 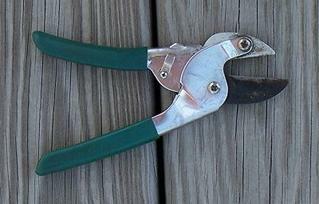 Garden pruners are handy for cutting off thick dead foliage or dried flower stems and stalks. Pruners come in different sizes so be sure to check that the grip size is comfortable for your hands when buying a pair of pruners. The hand cultivator or prong cultivator is used for lifting and loosening soil. It also comes in handy for light weeding.